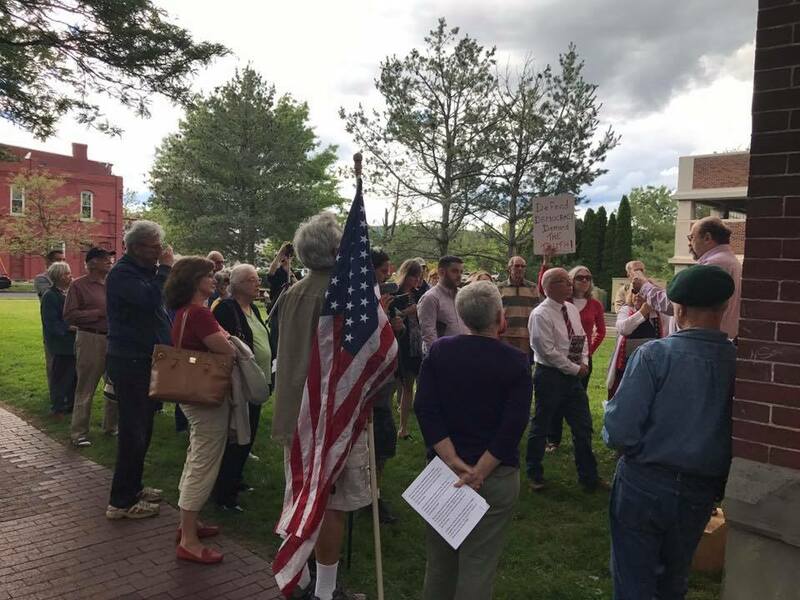 On Tuesday, June 27, Citizens for a Better Southern Tier came together in celebration of our nation, of our community. 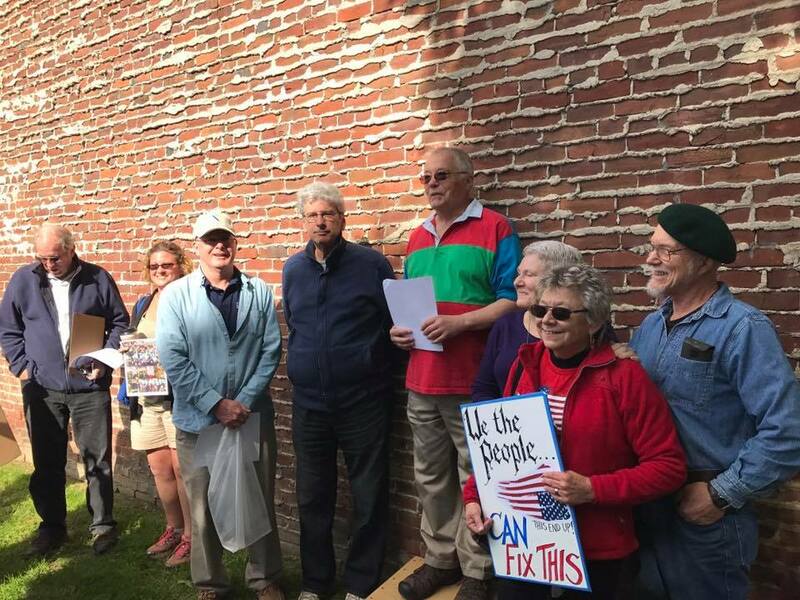 This was the nineteenth, near consecutive week we have gathered in front of Congressman Reed’s Corning office. We have met in all conditions imaginable; snow, rain, looming thunderstorms, even hazardous road construction. Nothing has deterred the people of the 23rd from showing up. Tuesday’s focus was different from any previous rally. We wanted the really to be one of reflection, gratitude for what we have in the Southern Tier. In these trying times, it can be so easy to lose hope, to become disheartened and discouraged; but this is when hope is of utmost importance. In the words of Mark Twain, Patriotism is supporting your county all of the time, and your government when it deserves it.” How timely that quote is today. We had three amazing speakers share their perspectives on what it means to be a patriot; Colleen Boland, Doug Couchon and Wayne Wells. Each served this nation valiantly. Often, when people speak out against the actions of their government, they are accused of lacking patriotism. The definition of a patriot is, “A person who vigorously supports their nation and is prepared to defend it against its enemies.” Each and every week, as I look out over the crowd that gathers, patriots are what I see. I know that these concerned citizens love this country and this community; that’s why they show up week after week in every possible condition- because they care because they want to make a difference! That is the very definition of a patriot, seeing that your country may not be perfect, but loving it anyway. Our nation was founded on the principal of popular sovereignty, the idea that government is subject to the will of the people. Our constitution begins with these three very important words: we the people. Those are the three strongest words that any nation can set forth in their constitution. But it goes further, and the next words are even more important; “We the people, in order to form a more perfect union.” We are aways striving to be more perfect, to be better.We don’t lose love for our nation when it does something wrong any more than we lose love for our children when they do something wrong. We strive to improve, learn from those lessons; be more perfect. And while the last couple of months have been soul-crushing, we keep showing up, speaking up because we know we have a voice. We know we can, and will do better. That is what Citizens for a Better Southern Tier stands for. That is who were are. We are citizens who see that our community, our nation is in grave times, yet we persist. We are resolved to continue the fight to make a better Southern Tier, a better nation for all. That, in my opinion is the height of patriotism.